Mark and I dined with Guy Sarton du Jonchay (Guy) and his wife Monika of Maison Vidal-Fleury at a recent event in Paris. After talk, tasting and red wines poured, our discussion got even more interesting. 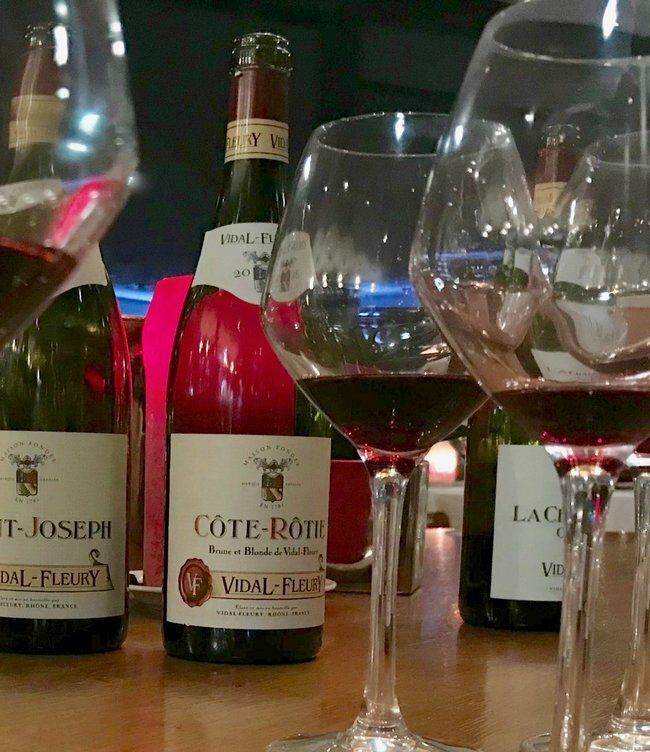 This article discusses the second part of that night when we discussed climate change as it relates to signature wines of a region. To read the first part about Grenache Blanc and Condrieu click here. Côtes du Rhône and Châteauneuf-du-Pape are two classic French wine appellations where terroir wines are made. Both derive their personality from Grenache. Like in many wine regions around the world, climate change is making it more difficult to maintain the characteristics of these terroir wines, wines that developed over a long time. As things warm up, grapes are ripening sooner in the year and have the potential to reach higher sugar levels. At the same time, other compounds in grapes that are important for making good wine may not be developing at the same rate. This presents a harvest and vinification challenge for growers and winemakers: when to pick and how to vinify the wines. Furthermore, phenolic compounds (phenols) found mostly in grapes skins giving color and tannic structure to the finished wine. If grapes are harvested earlier in the year to manage faster accumulation of sugars, the grapes may not reach “phenolic maturity”, resulting in wine lacking color and tannins. Let’s look at this with Grenache Noir, a grape that accounts for 71% of vineyard plantings in the Rhone. Research is under way to ascertain grape varieties better able to handle drought, or water stress. It’s easy to say we’ll replace Grenache with the Portuguese grape Touriga National. But when you replace a grape with one that’s not allowed per AOC (Appellation d’Origine Contrôlée) rules, you can no longer produce an AOC wine. 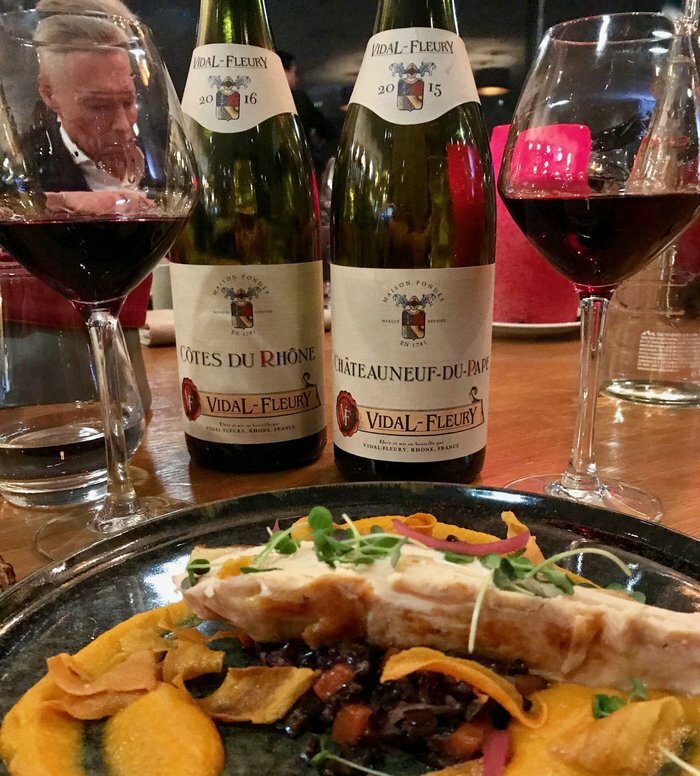 The signature of an AOC wine is the grape, i.e., a signature of Côtes du Rhone Rouge is Grenache, which accounts for the majority of the blend in a large number of Rhone Valley AOCs. If you change the grape variety, you change the signature; you are no longer making an AOC “terroir” wine. 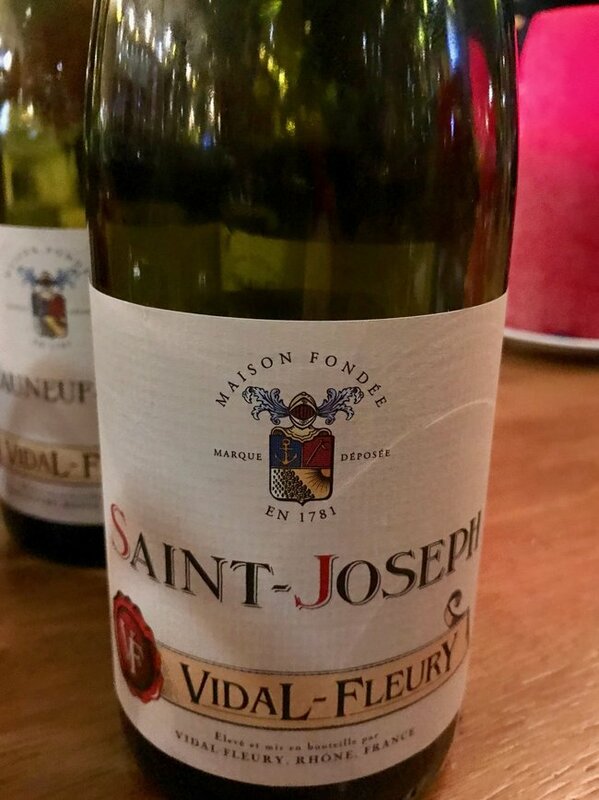 If you’re a fan of Maison Vidal-Fleury Châteauneuf-du-Pape (85% Grenache +/-) and Grenache is replaced, it’s no longer the same wine. How does the winemaker tackle this challenge? Below are things you can do from vineyard to wine that enable continued use of Grenache. Another is selecting yeast that result in wine with a reasonable level of alcohol due to less sugar in the grape juice. Chances are several changes will be needed which brings me to “massal selection”. Throughout history some growers planted new vineyards, usually from other vineyard cuttings. Or they replaced dead vines with those produced with vine cuttings from vineyards planted before the days of clonal planting. What you end up with is not a vineyard of Clone XYZ Grenache (as an example) but one containing genetic variants of the particular Grenache vine that was originally planted. How does this help us today? Instead of replacing Grenache with another variety you look inside your Grenache vineyard. Certain vines within a vineyard might behave differently, e.g., thrive in drought conditions. You select those particular vines to propagate a new vineyard. Doing this preserves the clonal variation of the older vineyard, which as stated above, was most likely planted with vines produced from wood taken from a region’s successful vineyards. Thus their vineyards are populated with vines having significant clonal variation; this is known as a massal selection. Maison Vidal-Fleury is located in Ampuis, nestled among steep, terraced vineyards in the Côte-Rôtie. At present, Guy is actively searching his Grenache and other vineyards for vines that behave more favorably to water stress and heat, and whose grapes contain less sugar. Guy’s winemaking involves grapes, lees and time. 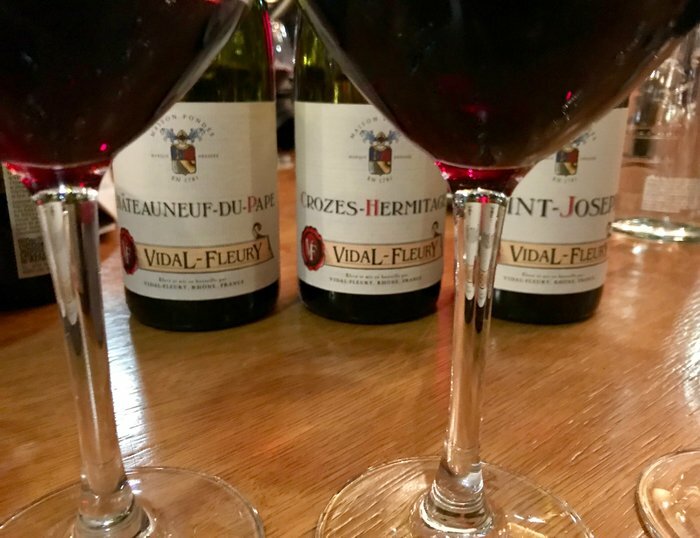 All Vidal-Fleury red wines age on lees. He doesn’t use any product in his wines because lees do the work. They’re the human system of the wines, protecting them from negative environmental influences. They’re removed a day before bottling. If you remove them before this, the protection is lost. Each of the following wines undergoes temperature-controlled maceration (30°C) and ferment with indigenous yeast. Wines are naturally clarified and stabilized by settling and one filtration. They are unfined with minimal sulfate use. Vinification: Long and traditional maceration (2 weeks for Grenache, 3 with Syrah and Mourvèdre). 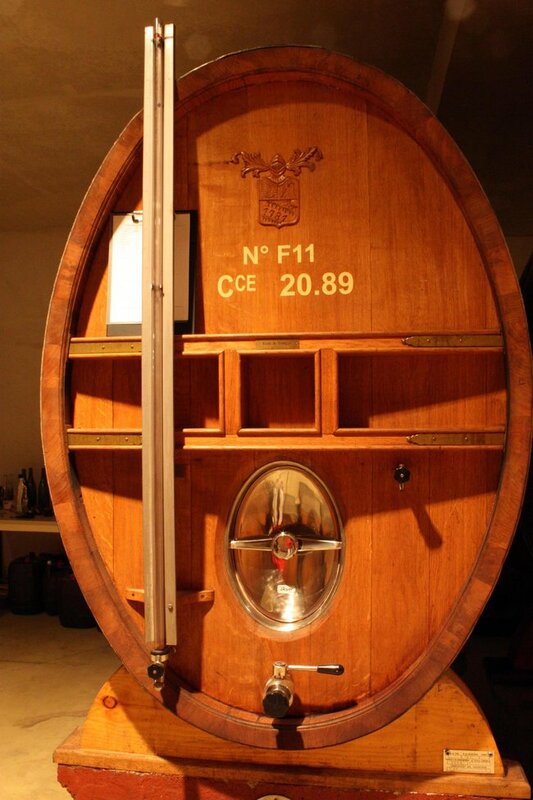 Aging: 70% in tanks, 30% in foudres (large older barrels). This round, well structured, and balanced wine offers cherry, raspberry, crushed violet, forest floor, and spices that linger. Bright yet soft tannins, a wine for any day and a variety of foods. Aging: on lees in large barrels for 2 1/2 years. Foudres (as seen to the left) are used for longer aging. The top of the barrel has a small opening for air exchange. It’s left open for the first year and regularly tasted. An intense deep ruby color; strawberry, blackberry, bramble, and soft prune with a sprinkling of violet and spice- these emerge from this medium-plus bodied and textured wine accompanied by rustically soft tannins and impeccable balance; fruity flavors and mildly smoked cherry dominate, finishing with roasted black pepper and cacao notes. A persistent, high quality wine. Aging: 3 months in tanks then 12 months in large barrels. Deep ruby in color; black currant, violet, pepper, twigs, and smoky vegetable hints; smooth and fresh, black fruit and wet earth dominate the palate. It showed a bit shy yet elegant. Guy shared it’s good with a variety of foods, especially barbecue and warm weather served slightly chilled. Vinification: 3-week maceration, indigenous yeast fermentation. Aging: 3 months in tanks; 12 months in large barrels. It has red currant, brambly black fruit, spices, and fleeting truffle aromas. Overall it showed a bit shy but you can feel the sassy elegance on the medium bodied, fresh palate. The tannins are fine and silky and the finish is licorice-tinged and thought provoking. I’d like to taste this wine in a year to see how it evolves! Aging: 2-years in large barrels. One of the unique things about Côte Rotie wines is this- Syrah is often co-fermented with Viognier. And this wine is a co-ferment of the two. Per appellation rules, the Viognier must be co-planted in the Syrah vineyard. Here the grapes come from two, side-by-side steep vineyard slopes: Côte Brune and Côte blond. Grapes from the Côte Brune provide the wine with structure. The soils are mica, iron-rich schist, have some red clay and less rocky. It typically results in dark, structured wines with less flavors. Côte Blonde provides finesse and flavors with gneiss, granitic rocky gravel and warmer soils. An intense, fresh bouquet of red and black-berries followed by violet, black olive, and smoky overtones. A beautifully fresh and balanced, medium-plus body with medium-plus fine tannins opens to cherry, blackcurrants, spices, white pepper, and curry leaf. Silky, forward and inviting. A charmer! Aging: On lees, 4-years in large barrels. La Chatillonne is the top wine in Vidal-Fleury’s line up. Syrah grapes are from the northern part of the Côte Rotie famed, Côte Blonde vineyard. In this part of the Rhone they refer to a wine from this vineyard as “a Blonde”. And this Blonde is from a colder part of the vineyard, and thus referred to as a “cold blonde”. The steep Côte Blonde vineyard is to the right of the sign, Côte Brune on left. “Blonde” wines are aromatic, balanced, and elegant whereas “Brune” wines tend to be dark and structured. The “J” is for Joseph, the early patriarch of Vidal-Fleury. Vidal-Fleury’s cooler vineyard area in the Côte Blonde is situated with more eastern exposure and granite-schist soils. It lies close to the Renar, a long valley in the Massif Central driving cooler temperatures on each of its sides. Vines here produce grapes with higher acidity and tannins resulting in more structure than other Côte Blonde wines. According to Guy, although La Chatillonne is 100% Côte Blonde, it combines the complexity of flavors and characteristics of a “Blonde” with those from its neighboring Côte Brune vineyard: structure. Production is small, just 300 cases (3,600 bottles). Because it’s a wine to age, Guy will happily cellar La Chatillonne purchases at his winery, offering perfect conditions. 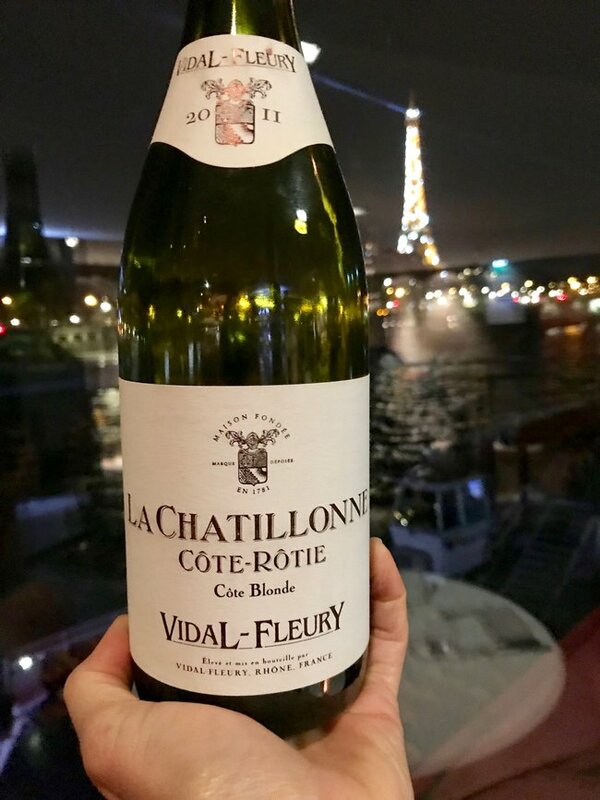 And so, while we didn’t solve the challenges of growing vines in a warming climate, we had a great view of the Eiffel Tower, learned more about the northern Rhone Valley, and tasted fantastic wines. 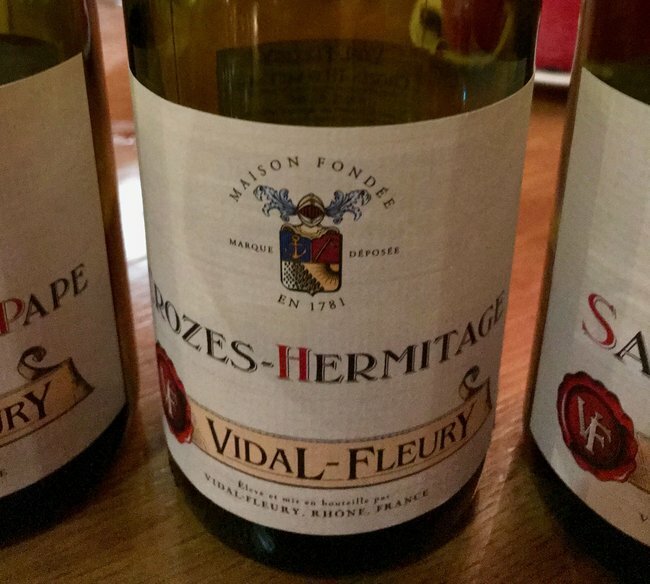 Should your path cross one of these Vidal-Fleury wines, you won’t be disappointed. Frederick Wildman distributes them in the United States. 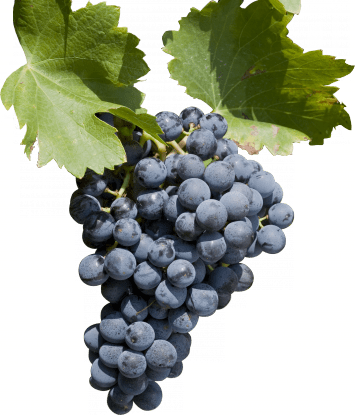 For information about Rhone Valley appellations, go to rhone-wines.com, also the source of the Grenache grape cluster photo. Incredible article, Lynn. I’m going to re-read and take notes. Thank you! Thanks Jill! This discussion with Guy was super interesting. There are things you know on the surface and things you dont. It certainly will be an interesting decade, and for all of us involved in wine. We’ll need to be our our toes as grapes, methods and rules potentially change. Okay, first…what a magical evening, the view, the wine, the company…you are living a charmed life my friend! Second…what fabulous insights on the effects of climate change on these vineyards. The adjustments to pruning, which seem counter intuitive at first glance, make so much sense and looking to massal selection seems a perfect adjustment. Of course eventually things may need to go further. Will the wines simply have to change in style and AOC rules be adjusted as our planet continues to change? It’s an interesting conversation that I see continuing and growing. Thank you for this wonderful piece. We just scratched the surface during our “magical” evening! The question was indeed will the wines have to change in style and AOC rules change. But there are a lot of things that can be done to adapt, in addition to what I mentioned in the article. Plus change means the style of wine the consumer has gotten used to will change. Another question is what will the consumer think about that? Thank you for your comment Robin! Wow! What a wonderful evening, those wines and the view…I enjoyed one of the Cote-Roties last winter with some beef stew, but didn’t have the view. Interesting discussion, showing how winemakers are so attuned to the changing climate. Every time I go to a seminar, workshop, tasting, etc., the topic of climate comes up. We’ll see how things will change in the wine world. Thankfully that view from the restaurant won’t be changing anytime soon! Nothing better than reading an essay where you are “boots-on-the-ground” like this one. Actually, you were in the boots, talking with the wine maker and owner directly. I could not imagine a better moment in life as that night. Magical. Thanks John, it’s very different being with a small group (just four of us) and have an evening with a winemaker. Roll your sleeves up time! As things continue to warm, we will see how Grenache handles the heat in the Rhone. Chock full of info. Enjoyed it. It was an info packed discussion, glad you enjoyed the article. Hope you are able to find a few of these wines, and the Condrieu from the first article is also a treat! I’ve never heard a more concise yet thorough explanation of massal selection! This was a wonderful article, well-researched and easy to understand. And I just love the photo with the Eiffel Tower in the background! Thanks Lauren! Some of this can get confusing so I appreciate your comment! Love your first hand experiences that you share on your blog. I always learn something new! 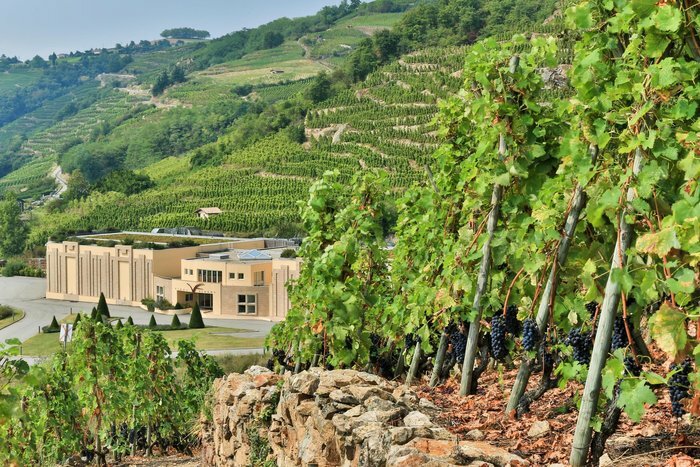 Climate change in the vineyards and winemaking pose real challenges and it is interesting to read how the wine industry is evolving to face those challenges. Thanks Jane! It’s a topic that has been, and will continue to be center stage and charged.